Here is short tutorial on how to get the Start Menu back in Windows 8. If you’ve recently upgraded to Windows 8 and you are missing the traditional Windows Start menu, there’s no need to worry. 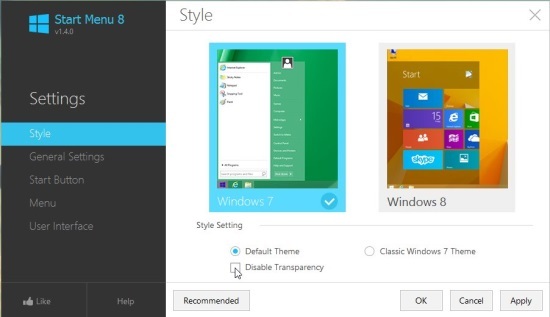 You can easily get the Start Menu back in your Windows 8 system using a third party software. Though there are number of such free Windows 8 Start Menu software available out there, the one we are going to review today stands apart because of its extraordinary features. 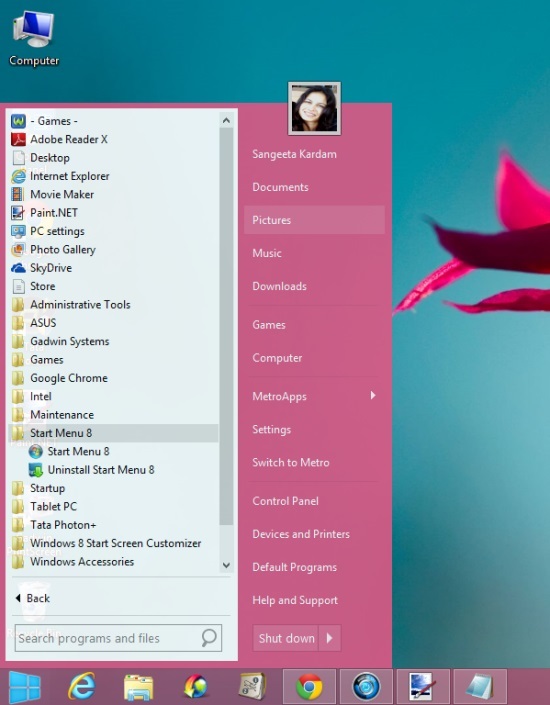 The software, called Start Menu 8, is a product of iObit Systems and can be downloaded using the link given at the end. The software is completely free and offers a wide range of features that makes it a must have for all Windows 8 users. These include flexible Start Menu options (Win 7 and Win 8 style), ORB changing options, bypassing Start Screen, adjusting Power Button action, and much more. Let’s have a detailed look on it and see how you can add a Start Menu using this free Windows 8 Start Menu software. First of all, download the software and install it in your Windows 8 system. (Don’t forget to uncheck the option to install an adware before clicking “Finish”). As you click finish, the Settings window of the software will open. By default it will show you the Style tab, where you get two menus to choose from: either Windows 7-style or Windows 8-style. For each of these menus, you can adjust the settings like enabling/disabling transparency and size of the menu. The next tab of this window contains some General Settings that includes Run on Startup, Skip Metro Screen, Deactivate Metro Sidebar, and so on. The next tab lets you choose a custom Start button ORB for your Start Menu. The next tab, which is the Menu tab, lets you control the visibility of the menu items. 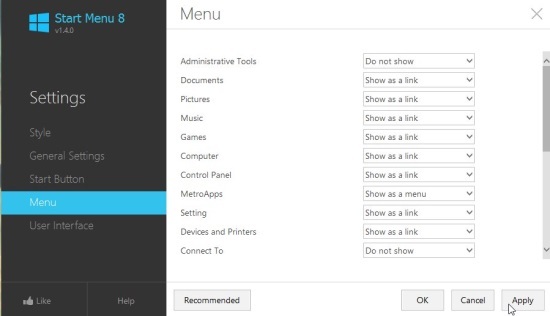 From here, you can make the programs/apps appear as a link, appear as a sub-menu, or do not appear on the Start Menu. The last tab, that is the User Interface tab, allows you to set a picture as your account picture which shows on top of the menu, adjust Font settings, language, and Power button action. Once you are done with the settings, you can click Apply and then OK to finalize changes. That’s it! A Start Menu will appear on your taskbar the moment you click OK. Now you can easily look for your apps or programs from within your desktop without having to switch back to the Start Screen again and again. 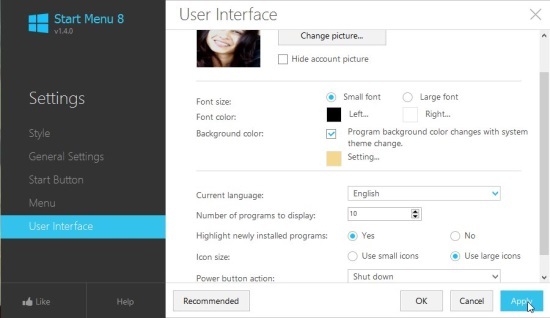 Also check out how to set any picture as your Start Screen background. Free Windows 8 Start Menu software. Multiple funky Start button ORBs to choose from. Option to show metro apps as a sub-menu in the Start Menu. Option to bypass Start Screen on system start. iObit Start Menu 8 is a great Windows 8 Start Menu software that offers to add a Start Menu to your Windows 8 desktop in both Windows 7 and Windows 8 Style. Plus it offers bypassing the Start Screen and applying multiple cool Start button ORBs to your system. A must try if you want to add a Start Menu to your Windows 8 PC. Get iObit Start Menu 8 here!